New Haven, CT – The Walter Camp Football Foundation has announced its All-America Alumni NFL Offensive and Defensive Players of the week for games ending November 16. 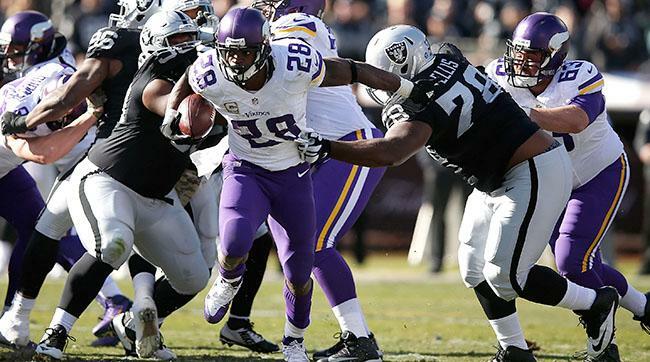 Adrian Peterson rushed for 203 yards and one touchdown as the Minnesota Vikings improved to 7-2 with a 30-14 victory over the Oakland Raiders. Peterson was a three-year standout at the University of Oklahoma and rushed for 4,245 yards – the second-highest career total in OU history. Peterson set the school record with 1,925 yards in 2004 and was named a Walter Camp First Team All-American. Will Allen had eight tackles and forced one fumble as the Pittsburgh Steelers defeated the Cleveland Brown, 30-9. A collegiate standout at The Ohio State University, Allen earned Walter Camp First Team All-America honors in 2003.